Moving day brings a whole lot of emotions. You can be filled with joy or trepidation. Sometimes both. Even if you think of moving day as a happy event, it’s likely going to be filled with stress. A big source of that has to do with the fact that no matter how hard we try to organize, there’s a good chance that something important will be forgotten. At A.B. Richards, we help people get organized by renting portable storage containers to give our customers more storage space and flexibility. We often have customers who are in the process of moving or organizing a move, so we want to help you get ready by offering tips on the 7 most common things people forget when they move. There are certain things that you have to make sure goes to the new place, particularly if it’s your first new home or apartment. Forbes recommends that you don’t forget to pack kitchen items such as bottle openers, wooden spoons, a spatula, and tongs, as well as an oven mitt and measuring cups and spoons. In the living areas don’t forget lamps, coasters, a TV cabinet or home entertainment center, mirrors, hampers, hangers and wall decorations. Bathrooms need a plunger, scale, shower curtains and bath mats. Don’t forget cleaning products, tools and safety materials like flashlights, first aid kits and a fire extinguisher. Moving isn’t always about packing. You have to make sure you notify important parties about your move. This includes filling out a change of address form and contacting your car insurance company if you’re moving to another state. You need to notify your child’s new school of a start date and utilities of your moving date. Don’t forget to register to vote in your new location as well. People tend to forget about the last items that haven’t been packed before the move, according to the Moving.tips website, things like toiletries, wall decorations, unpacked clothes, even kitchen appliances such as coffee makers or microwaves tend to be forgotten. Also check outside, and make sure you brought your lawn furniture and barbecue grill. 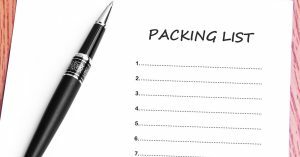 One universal truth that people sometimes forget to pay attention to when they move is, “What is packed must also be unpacked.” You’ll save yourself a lot of time if you keep a list of where items in each box are supposed to go. Itemize what’s in the box and consider using a color-coded system to recognize what boxes belong in what room. It’s not just the keys to the front door that need to change hands. You also have to make sure that the new owners have keys to the garage, basement, any interior doors, cabinets, anything that’s padlocked and anything else that requires a key. Save yourself that second trip and go through your home to see where the locks are. Everything will eventually be unpacked, but it helps to be prepared for what you need on the day of the move. Make sure you know what shouldn’t be packed, like your checkbook and credit cards. You’ll probably need to have them handy. You’ll also want to have quick access to the first things that need to be unpacked, like toiletries, batteries, flashlights, sheets, towels, and blankets. If you have children, you also might want to make sure you have toys, books, and games available to keep them occupied during the move. Sometimes when you move, you may find that what you had stored in the old place may not fit in the new place. Or you may need some extra time to organize your belongings. Or there may be a delay before you can move into the new location. All of these problems can be handled by renting a portable storage unit from A.B. Richards. We can help ease some of the stress by charging you only once for pickup and delivery. Contact A.B. Richards today.